The possibilities of automation and digitisation are increasing exponentially. This poses a challenge for developing and emerging countries. The Chinese government has recognised this and actively facilitates automation. When we apply this thought to the situation in emerging and developing countries, this could mean that China might have been the last country that has come to prosperity by the classical industrialisation process - the mass production of simple goods with a big supply of unqualified, cheap labor. Why struggle with the typical problems of emerging countries - corruption, government red tape, poor infrastructure etc., if the capabilities and flexibility of automatic production solutions are increasing while they are becoming more affordable at the same time? The Chinese government is observing new technologies and their potential carefully, however. According to the "Made in China 2025” strategy published in May 2015, China is supposed to catch up with technologically-leading industrial nations due to a higher degree of automation and intelligent, interconnected production processes. During a trip of Chinese businessmen to Germany organised by our firm in June, ‘Industry 4.0’ was one of the major points of interest. 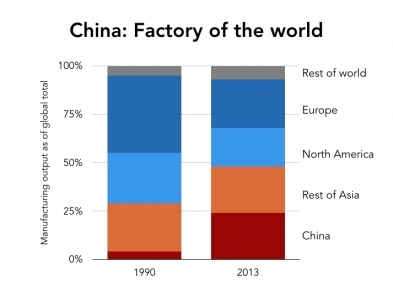 China is responsible for 1/4 of the global manufacturing output. Due to existing supply chains, the country will keep its position as factory of the world. China will become a leading market for automation. The following diagram shows how China’s share in global manufacturing output grew from a mere 4 percent in 1990 to approximately one quarter today. As the events of the past months have shown, the growth model that formed the base for this unique development has reached its limits. If China wants to keep its position, the country must not only reform its legal and educational system, it must also automatise its manufacturing sector. Risen labor costs, a diminishing supply of labor, increasing quality requirements on sales markets as well as a more responsible usage of resources force the country to do so. The increasing capabilities of intelligent, interconnected production processes, which are making early-industrialised countries more competitive again are increasing this necessity. A ‘reshoring' has not taken place to the extent some market observers were expecting 1-2 years ago, however. We are having more the impression that Chinese manufacturers are trying to move up the value chain and to produce better quality products with a higher degree of automation. Due to existing supply chains, also the exodus to countries with lower labor costs has been limited, so far. The huge industrial base together with the big automation potential on the one side as well as specific characteristics of Chinese automation customers and aggressive new competitors will make China a new leading market for automation products. Chinese Consumer Internet companies are among the most innovative in the world. 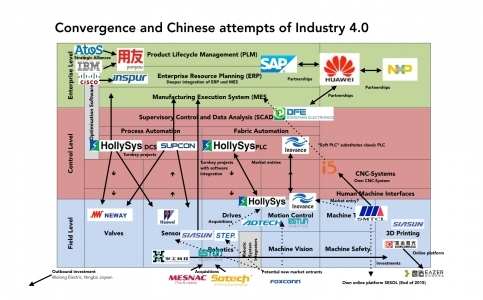 We expect that China will come up with its own solutions also in the Industrial Internet. 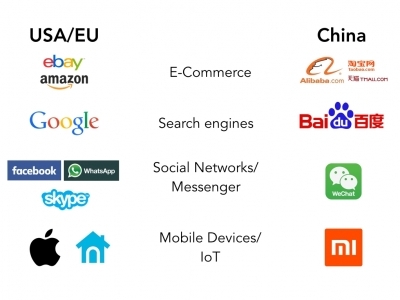 As the following illustration shows, Chinese companies have developed their own solutions and generated new business models for every application in the Consumer-Internet. In E-Commerce and Mobile Commerce, China is the most innovative market in the world. With its urban middle class of over 100 million people, this might also happen in the Internet of Things. This has been partly facilitated by the Chinese government, but not entirely. Surely, Baidu benefitted from the fact that Google’s search engine has been blocked in China since 2009. Also WeChat probably had it easier without Facebook in China. In other cases, Chinese firms have prevailed over Western competitors because they understood the specific characteristics of the Chinese consumers better and adapted their business models accordingly: While eBay tried to transfer its business model 1:1 from the United States to China, Alibaba set up his own payment system Alipay, in which the online retailer acts as a trustee - given the low proliferation degree of credit cards in China ten years ago, an essential prerequisite for the acceptance of an online trading platform. Also, both Google and Facebook are watching the development of WeChat very carefully and are trying to copy some of its features these days. The example of WeChat shows something else, however: Chinese Internet applications will make their way out of China, sooner or later. For non-professional users, WeChat is the most reliable program for videoconferencing from China with other countries, because it copes better with the Great Chinese Firewall than Skype or FaceTime do. At the launch of the Apple Watch, WeChat was already placed more prominently than its Western counterpart WhatsApp. Of the companies in this illustration, Xiaomi falls into a category of its own because it also produces hardware. The company has been founded in 2010 and shipped 62 million smartphones last year. On some days, up to 800,000 units. The 1.5 million member fan base Xiaomi Shequ suggests and votes about new features every week. The operating system is updated every Friday. Meanwhile, the company also produces TV boxes, fitness trackers, air purifiers and smart sockets that are connected to the home Wi-Fi , etc. With a customer base of over 100 million users, the company is aspiring to become one of the leading players in the Internet of Things. Who might be the Alibaba, Wechat or Xiaomi in the Industrial Internet? One of the guiding questions for our study was, if something similar might happen in the field of automation or - one step further - in 'Industry 4.0', the 'Industrial Internet' or the 'Internet of Very Important Things'. The development of a genuine Chinese operation system for computers and smartphones lead into this direction. In front of this background, we asked in our study 'Which companies might be the Alibaba, WeChat or Xiaomi in the field of Industrial Internet?’ Correspondingly, we analysed the 18 major segments along the automation value chain in China. The thoughts and illustrations are from a speech given by Georg Stieler at the annual congress of the German Electrical and Electronic Manufacturers’ Association (ZVEI) and a management meeting of the German Engineering Federation (VDMA)/German Machine Tool Builders Association (VDW) in Fall 2015. For further questions, please send us an email or give us a call +86 21 2218 3015.